In his first major policy speech as House Speaker, Wisconsin Congressman Paul Ryan (R-WI) said he wants Americans to be confident again. 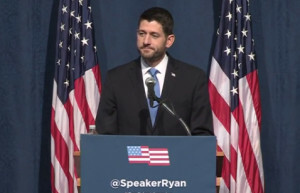 Speaking at the Library of Congress on Thursday, Ryan laid out a vision for Republicans that includes controlling the White House after 2016 and coming up with a plan to counter Democrats. “Our number one goal for next year is to put together a complete alternative to the left’s agenda,” Ryan said. That agenda is expected to include reforming the tax code, reducing regulations on businesses, and tougher federal work requirements for public assistance programs. The Republican from Janesville said many of those policies are holding people back right now and limiting job creation. Ryan also said the GOP will unveil a plan to repeal and replace every word in ObamaCare. “There are a lot of other ideas out there, but what all conservatives can agree on is this: We think government should encourage personal responsibility, not replace it,” Ryan said. The Speaker also touched on homeland security and the need for a stronger military. “A strong America does not threaten the peace. A strong America is what protects the peace. Now we need to act like it. ISIS is a serious threat. We need a strategy to defeat it,” he said, while stressing that reforms are needed at the Pentagon that allow to adapt to new threats and acquire new capabilities faster.